Shilpa and Suhrid are world travelers. Despite having two kids and busy professional lives, they have prioritized getting out of the country as a family as well as on their own. It was only fitting, then, that Shilpa would want to gift Suhrid a painting of the trip where it all began for their 15th Anniversary – the place where they got engaged. Shilpa and Suhrid's living room, where the commission currently resides. When Shilpa first came to CoCo Gallery, she wasn’t entirely sure what she wanted, however. She brainstormed a number of ideas with her CoCo Consultant, including a gallery wall of 10 watercolors that each represented one of their trips together. 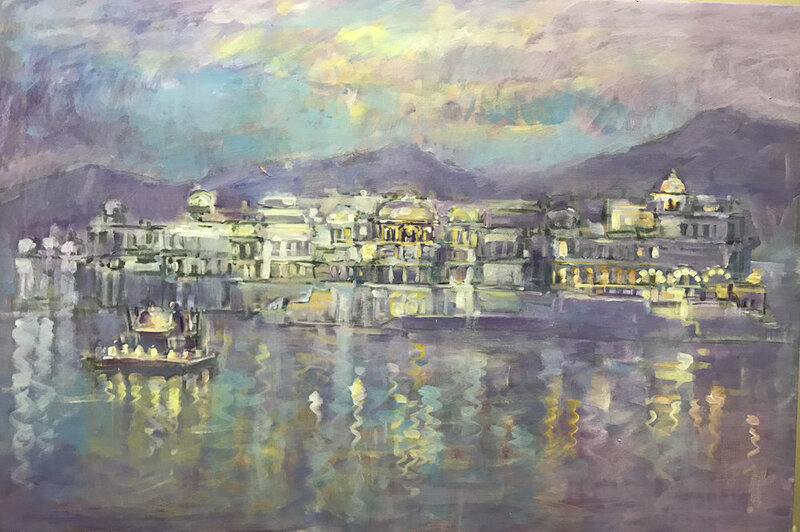 While we had the perfect artist lined up to help her with this idea, some twists and turns led her to choose an impressionist rendition of the Taj Lake Palace in Udaipur, India…the breathtaking backdrop of where Suhrid had proposed. The artist that could best do this was prominent in his field from India and just happens to be in our network: CoCo Artist Teji K.
The "Taj Lake Palace" commission: conceived by Shilpa, brought to life by CoCo Artist Teji K.
Shilpa found an image of the Taj Lake Palace online, as a sample representation of the 24” X 36” impressionist painting she wanted. 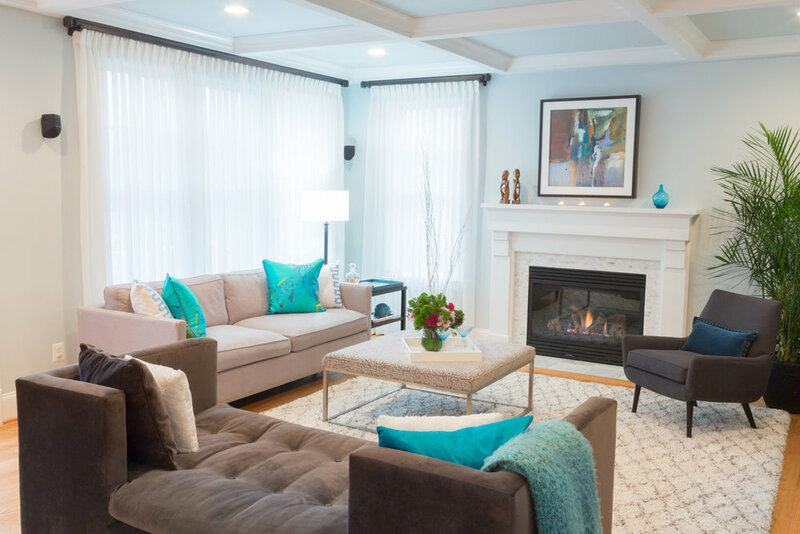 It was important to her that the painting primarily had blue and purple hues, to fit well with the interiors of their fully designed living room. She also wanted to make sure there was a tiny indication of a couple having dinner on a pontoon near the palace, representative of their evening on that special day. A sample of the blues and purples Shilpa wanted for the painting. The living room where the painting will reside. Having a highly layered and textural style, Teji thought it would be best to sketch directly on the canvas and to adjust his work based on frequent feedback. While the online image Shilpa found was more aerial in view, Teji chose to take a more head-on perspective of the palace. He thought it would better represent a special event that happened there rather than to just highlight the stand-alone site. Shilpa fully agreed, and Teji got to work with his acrylic paints soon after. The online image of the palace that was used as a reference. Within a few days, Teji had filled in the base of the work with paint. At this point, he starts his unique spatula-technique, where he creates the impressionist look by layering paint using just a palette brush. Once he uses the palette brush, he can change the colors of the painting but not the composition. Shilpa was on board with the base of the painting, thus, Teji carried on. The base of the painting, before the spatula technique. Later check-ins were not as smooth as the earlier ones. Shilpa’s primary feedback was that the painting looked “spooky” because of the number of shadows that were in the palace. Teji took the feedback seriously – he brightened the painting a bit, and put lights into the corridors of the palace so that it looked less like a haunted house and more like an evening-lit palace. With that, the painting was done. Within three days of being fully dried, the Taj Lake Palace commission arrived from New Delhi, in pristine condition, rolled up in a tube, at Shilpa’s front door in Arlington, VA.
For years, Eva and Anton had been searching for the perfect representation of their experience as ex-pats in New York City. To them, the most special thing about NYC was the energy within, without, and all around it. It’s this energy that has been the backdrop of their growing family’s life here. When the couple came across CoCo Gallery and Piero M.’s work, they knew they had finally found the artist who could visually express their feelings about the city. So many of Piero’s works have bursts of color and complex texture that signified rapid movement city’s everlasting vigor. Thus, their commission began. NYC in Motion, by Piero M.
Request: The couple wanted the skyline, from downtown to midtown, depicted with the water and bridges prominently featured as well. Eva’s vision included small details – the presence of a cab, people, and bike riders, things that would help display the perpetually stirring nature of the city. Piero M. quickly produced a digital rendering to hightlight for Eva and Anton the most important aspects of the painting. Initial Rendering: Piero quickly produced a digital rendering that helped highlight the most important aspects of the painting, to give the couple an impression of the final product. One of the defining aspects of Piero’s paintings is that each contains a section of improvisational multi-colored texture, which allows the painting to go into the abstract. The rendering simply cannot shed light on this aspect of the painter’s style. Piero made sure that Eva and Anton would be okay with embracing the unpredictability that came with this part of his painting in its final form. Once the couple was on board, Piero got to work with acrylics on canvas. Piero M. added more color per Eva and Anton's request to the sky and water. Check-in, Feedback, and Final: Within one week, Piero was almost done with the painting and he sent the couple a photo of the progress. They were overjoyed, but there was just one thing missing in their minds. It lacked a certain brightness; it didn’t convey the overall feeling of contentment they had living in the city. Piero knew just what would flip the switch – he added a touch of color to the sky and water. That did it. It now happily hangs on top of Eva and Anton’s living room couch, and it is set to accompany them on their upcoming move out of the city. The final painting now hangs above Eva and Anton's living room couch. Bay area resident, Deepika, recently commissioned a special work as a surprise for her husband. She chose CoCo Artist Justin C., an abstract figurative artist who is from New York City but works out of Norway. Here’s a little bit about how her commission played out. Salkantay Trail, by Justin C.
CoCo: What was the inspiration for your commission? What were you looking to do? Deepika: My husband and I had gone on a trip to Peru the year before and it was a very important trip for us as it was a celebration of success, on many fronts, for us both. Unfortunately, I lost my phone at the end of a 5-day trek in the Andes and lost all the photos. But then I stumbled upon CoCo Gallery. I figured that commissioning a painting was an excellent opportunity to give shape and form to a memory that only existed in our minds. Plus, it would be a great way to buy our first painting. Our wedding anniversary was coming up so I immediately jumped on the idea! Deepika: Of the three artists that my CoCo Consultant shared, I found Justin C. to have the style that spoke to me. I saw his painting titled Ugruk and knew that he was kind of free spirited in his expression and that's the kind of feeling I remember having when I was in Peru, so I felt he would be the right artist to bring my memory to life. I did have a second option in mind, but CoCo helped me zero-in on my top choice. CoCo: What do you remember about your first conversation with the artist? Deepika: Our first conversation felt like he was really listening, he had looked at the materials I had shared earlier. He sounded really sweet and accommodating too. I felt comfortable having him use his imagination to create the painting I had in mind. Justin C. adjusted the initial sketch because Deepika wanted to show her husband helping her cross the stream. CoCo: Were you nervous about anything going into commissioning? Were your concerns allayed and how? Deepika: I tend to be very verbose and detailed in my descriptions of what I am looking for. I was worried if I had left little room for Justin to express himself. CoCo’s guidance on how much direction to give to artists was helpful. CoCo: If you had a very particular idea in your head of what it would look like, how did the painting turn out differently than that? Deepika: The painting turned out very similar to what I had expected. I didn't realize how layered/textured the painting would be, so when it arrived and I saw how it looked up close, I was pleasantly surprised. I like that about it. Justin C. eventually altered the painting to give it a more impressionistic feel per Deepika's request. Deepika: Help in choosing the artist from a shortlist and also in understanding how to provide input to the artist in the most productive way. Deepika: It's hanging in our bedroom!